We are thrilled that Emeli Sande’s new single ‘Breathing Underwater’ is Radio 1’s Track of the Day today! Rosie Danvers wrote the string arrangement for this glorious tracked, penned by Emeli Sande and Chris Loco, back in April 2016. They went on the record it with a sixteen piece string section at Air Studios with TommyD and engineer Jake Jackson. ‘We were an amazing team that day. I had written the arrangement and then played cello on the recording. Producers TommyD and Chris Loco guided us brilliantly to a great performance, Emeli contributed great ideas and inspired us as always and Jake Jackson engineered and recorded the session. The results speak for themselves. It is one if the MOST beautiful songs we have had to privilege to work on and it really felt like a magical moment in time! 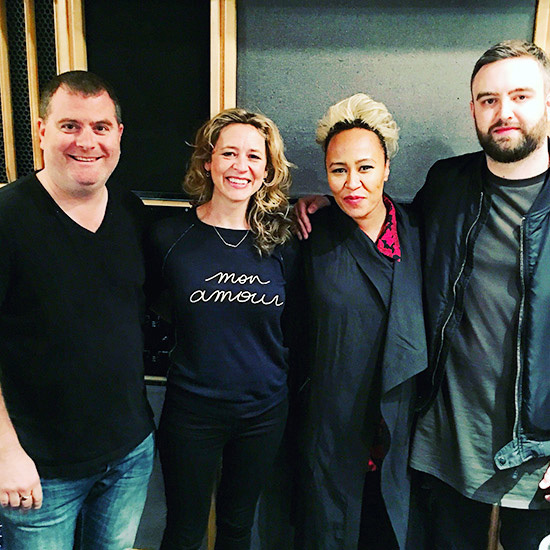 The photo was taken in the control room at Air Studios just after we finished recording..
TommyD, Rosie Danvers, Emeli Sande and Chris Loco.